We’ve had lots of new Brandefy Review Requests come in and we are LOVING it! You all are searching for loads of products across different categories. From ice cream to paper towels, and baggies to mayo (yes, we taste-tested mayonnaise), Brandefy has got you covered. See what store brand products hit it out of the park, and which ones are getting benched. This is a very close dupe and functioned well for the eyes. They come in similar bottles that are easy to use. We recommend switching to save. Testers thought these were very similar with slight, but not too noticeable differences. Freshen up and save $. Our beauty guru felt this was a great value for the price. She found the smell, feel, and functionality to be very similar overall. These two sunscreens feel extremely similar. The Neutrogena has a slightly stronger smell than the Trader Joe's, but they both rub into the skin quickly and smoothly. 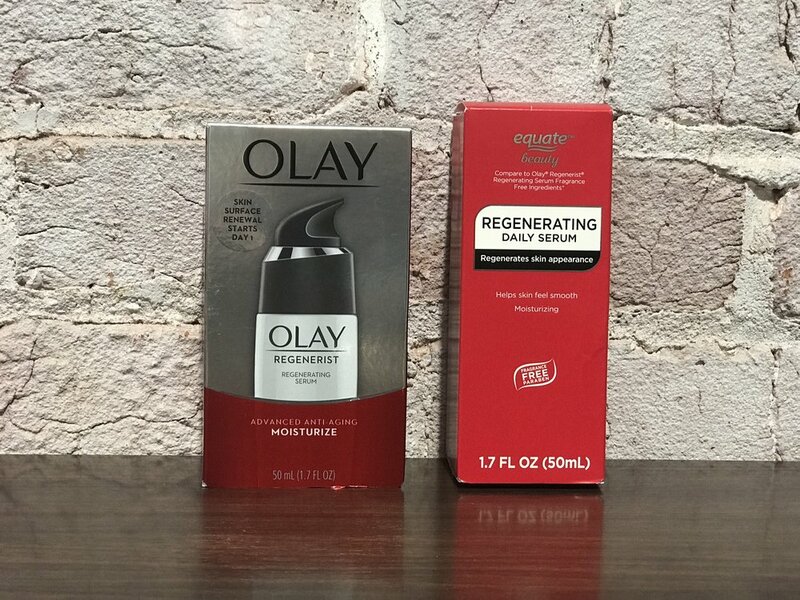 The only notable difference is that the Olay smells far more floral, while equate has no detectable smell. Other than that, this is a good dupe across feel and functionality. 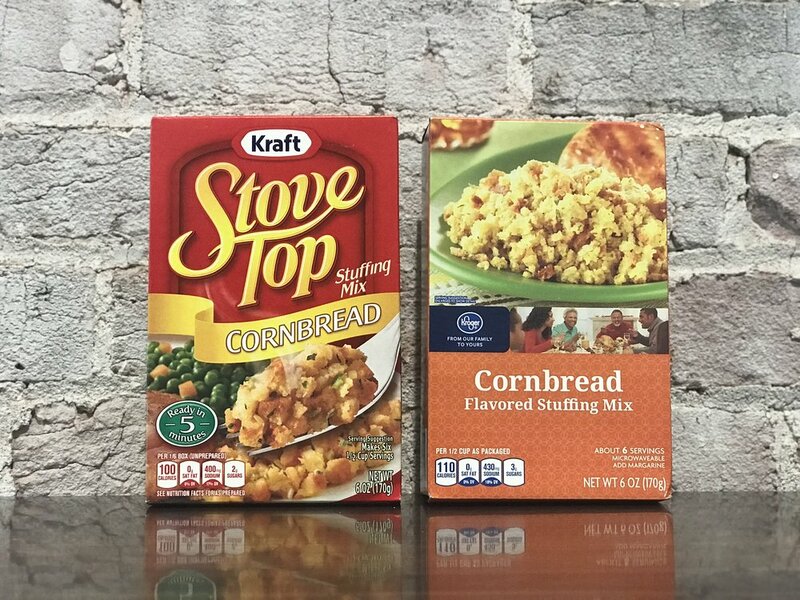 All of the testers would switch to save and no one could tell these apart in a blind taste test. The store brand does have 3 more grams of sugar per serving and the bottle is bigger, but we'd switch on taste alone! Note- the store brand has NO high fructose corn syrup, and the name brand does. Our bread expert would switch and he noted that he preferred the texture of the store brand. Three out of five testers could not tell these apart in a blind test. Those who could noted the store brand soda had a stronger taste of sweetener. All testers would switch to save and our Dr. Pepper/general soda expert, Aaron from Soda Jerk, said he was amazed by how close the Walmart version is to the name brand. Half of the testers could not tell these apart in a blind taste test. Those who could noted the store brand has slightly more cherry flavor. These two spreads were very close along taste and texture. We thought Hellman's had a little more vinegar, but it's not very detectable. All testers preferred the store brand to the name brand, they thought it had a better texture and more herbs in the flavor. Four out of four testers would switch to save. These were extremely similar and a great dupe. 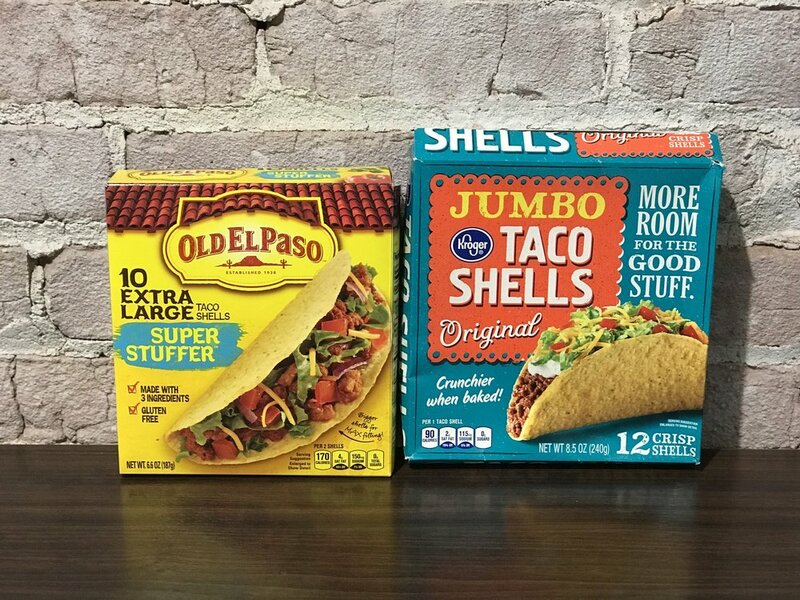 We should note that Old El Paso are made in a gluten free factory, and Kroger cannot make this gluten free claim. Our testers would switch to save, and noted taste and smell were very similar. 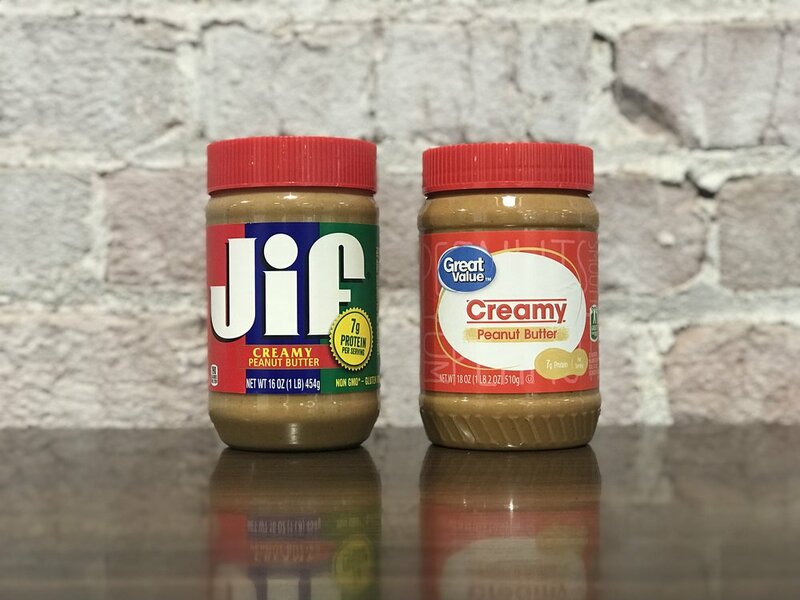 However, Jif has a smoother texture. Testers would switch to save. The Kroger ice cream has a plastic lid lip that protects against drips. The Kroger is more of a whipped cream texture while Turkey Hill is firmer and like traditional ice cream. The cookies in the Kroger ice cream come in bigger chunks. While the Kroger is a similar substitute, testers thought the name brand had a slightly stronger grapefruit smell and flavor. These are some of the better generic dish packs we've found- for starters, the Home Sense has gel in the packs, as well as the powder. We tested them on long set-in grease and they got the job done. Dishes smelled clean after use as well. Testers thought the Kleenex brand was slightly more silky than the store brand. They also noticed that the Kleenex tissue was more durable. If you want a luxurious way to blow your nose, keep with the name brand! If you want a less expensive, but decent tissue overall, switch to save. Peter Thomas Roth brand is creamier/thicker and leaves our skin feeing silky; while Ulta brand was slightly more sticky to the touch after applying. Ulta brand smell far more floral, as well. The Perricone cream had a thicker/ oilier substance to its feel, this coated the skin more than the Ulta. Perricone feels more moisturizing. Ulta smells more floral. The Great Value soup is much more powerful on the mushroom- both in smell and taste. If you have a mushroom-loving crowd, throw it in your next casserole. However, we recommend Campbells if you are going for a more subtle Cream of Mushroom. The Cheerios have a toasty grain taste, and the Great Value O's have little to no taste. Stick with the one and only Cheerio-os! 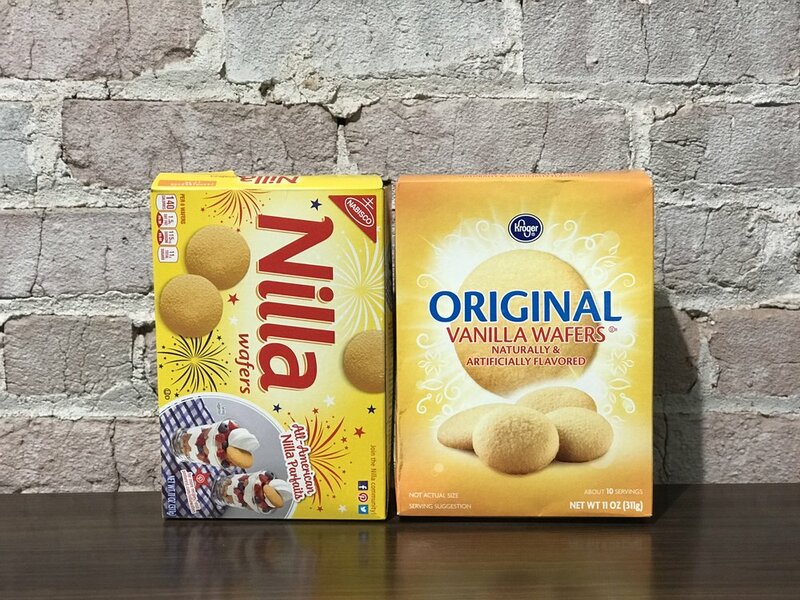 The Nilla wafers has more of a powerful flavor. We noticed more notes of vanilla, sugar, and butter- stick to the name brand when you want a sweeter treat. Testers commented that the Silk milk was much richer and tasted like vanilla dessert. Stick with the original! The testers were split on this one, and it comes down to preference here. Breyers is a firmer, yet still creamier, ice cream. Food Lion does have a stronger vanilla taste, so if taste is more important to you, you can switch to save! The Great Value Fig Bars contains high fructose corn syrup, while the Fig Newtons do not. Additionally, the Newtons come in a top seal container, and the Great Value comes in wrapped sleaves. Testers thought they tasted similar, but there's more fruit to cookie in the Fig Newton. If you don't mind the corn syrup, switch to save. Our expert tester found the Food Lion bag to be easily breakable, thinner, and more difficult to open and close. Ziploc is the superior bag in this case. The Charmin toilet paper has a smoother texture and feel. The Great Value has a raised texture and is rough feeling. The Charmin also gives you more sheets per roll. A big, “THANK YOU!” to our app users for submitting your review requests! Want to see some of your favorite products reviewed? Submit a request through the app or comment below.